On September 21, 2012, Paris’s Cité du Cinéma, a studio complex first proposed by producer/director Luc Besson in 1997, opened to great fanfare in the northern Paris suburb of Saint Denis.1 Marketed by its promotors as “Hollywood à la Française” and refered to by locals as “Hollywood-sur-Seine,” the Cité aims to draw globetrotting filmmakers away from competing production sites such as Cinecittà, Babelsberg, and Britain’s Pinewood Studios by offering big budget studio infrastructure within a métro ride of central Paris.2 The Cité’s main attraction consists of nine modern production stages situated around the luminous glass-and-steel nave of a 1933 Art Deco-style Electricité de France (EDF) power station. French film authorities and the studio’s promoters are fêting Besson as a visionary who promises to put France on equal footing with American cinema. The Hollywood “dream factory” has finally, they wager, met its match. Fig. 1: La Cité du Cinéma, Reichen et Robert & Associés, 2012. Besson’s backers may hope the similarities end there. The Cité Elgé did not house the cinematic resurgence that Delluc envisioned in the 1920s. Ironically, given Gaumont’s early role in developing recorded sound, its celebrated infrastructure ultimately proved inadequate for new recording techniques.4 But despite what rhetoric like Delluc’s might suggest, Gaumont had been making no assumptions about the promise of its filmmaking future. Building on other aspects of its studio infrastructure – which on the eve of World War I included more than two dozen buildings housing everything from set design workshops and poster artists’ studios to printing facilities and research and development labs – Gaumont had already begun to expand its scope well beyond film production. In the eyes of the company’s backers, film would be only one part of Gaumont’s vision for a future place in the broader technological and media landscape of industrial modernity. This article examines that place by arguing for an alternative history of Gaumont as not simply a film company, but as an intermedial producer of technology and visual art. Just as Besson’s emphasis on studio infrastructure at the new Cité du Cinéma should remind us of the persistent material requirements that, almost a century later, continue to underpin film production in the “immaterial” world of digital cinema, so we should look back to the Cité Elgé with an eye to the important ways that studios have long contributed to the kind of intermedial relationships that have conditioned today’s “convergent” new media landscape.5 During the decade following the onset of World War I, studio development brought cinema into dialogue with broader twentieth-century networks of technology, science, and media. At Gaumont, this process helped precipitate the concretion of cultural expression and industrial practice that defined what Siegfried Zielinski has termed “audiovisual discourse.”6 More specifically, this article argues that municipal politics, military state sponsorship, and corporate policies of infrastructural development shaped cultural production by making film only one part of Gaumont’s convergent techno-media practice. My argument rests on two methodological assumptions – one about the character of networks, the other concerning the limits of media archaeology – that make this history of particular relevance to the development of “network archaeology” as a mode of historical practice. First, precisely as a form of “archaeology,” network archaeology should draw our attention not only to the history of objects, but also and especially to the ways those objects emerge and develop in place. Networks are, by their very nature, dispersed, but they are not without nodes, vectors, and areas of coverage. This article focuses on the film studio as a key node in the cinematic, technological, and media communications networks that shaped cinema’s industrialization in the first quarter of the twentieth century. 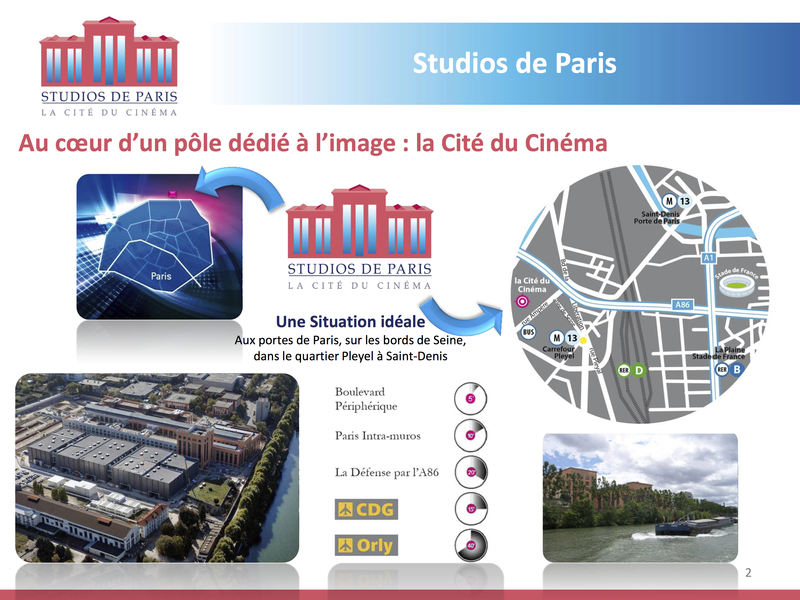 At film studios – especially “studio cities” like the Cité Elgé – systems of intellectual, material, and methodological exchange crystallized and enhanced the ideas developing in dispersed fashion across these networks. Such ideas, in turn, contributed to the emergence of new networks and network technologies like the wireless communications systems that Gaumont hoped would help revive its declining business. In short, Gaumont’s history demonstrates the importance of investigating the mutually reinforcing relationships between conceptual and physical networks, both media and non-media alike. My second methodological assumption follows from this attention to the importance of non-media networks. In analyzing the conditions in which media and technological networks have emerged and interacted, this article develops an integrated history of media that includes non-media technologies. In doing so, it stresses the value of expanding how media studies and media archaeology view “media” by focusing on what Lisa Gitelman, in her definition, describes as the “technological forms and their associated protocols” that underpin structures of communication.7 These technological forms must include the non-media technologies and technological networks that provide material and conceptual continuities between old and new that help explain why “new” media never simply replace their predecessors. Ultimately, the power of network archaeology – more than any new methodology it might create – may be precisely the networks of methodological exchange and models of cross-disciplinary analysis it promotes. By bridging film studies, media archaeology, and the history of technology, this article will suggest that such networks of scholarship can give us better purchase on the complexities of infrastructural development and the important ways that materialist history – as a form of making the past visible – can contribute to what Lisa Parks has termed the “politics of infrastructural visibility.”8 Making the history of Gaumont’s industrial practice visible reveals important ways in which infrastructure has long guided film’s industrial and technological development in ways too seldom recognized by film historians.9 By the same token, tracing the networks of exchange between film companies and early twentieth-century networks – from electrical grids to wireless communications systems and radio signals – should encourage historians of technology to devote greater attention to cinema’s important role in the history of industrial modernity and the second industrial revolution. It was in this moment, after all, that companies like Gaumont helped create the infrastructure for the “new” media that has, ironically, made cinema little more than an afterthought in histories of modern technology.10 As this article will make clear, network archaeology will offer much to (new) media studies by recovering the histories of these forgotten networks and the networks of influence they helped form on the basis of “old” media infrastructure. During its industrialization between 1897 and World War I, Gaumont’s Cité Elgé responded and played host to a number of important technological developments in cinema and in the broader processes of modernization that were transforming the city of Paris.11 The company came of age, after all, during a period in which the still-new Tour Eiffel – Paris’s great fin-de-siècle symbol of the tensions between art and technology, spectacle and utility, and rationality and faith in progress – looked down upon the implementations of two modernity-defining technological networks: the métro system and the city’s first electrical grid.12 Representing more than simply the historical context for Gaumont’s emergence, these networks had real effects on the company’s (and early cinema’s) development. From its studio expansion plans to its research and product development strategies, the broad intermedial scope of technological and artistic production that Gaumont fostered during the 1910s and into the 1920s came as a direct result of the material and financial conditions created by the city’s turn-of-the-century infrastructural developments. Funded by backers including Gustave Eiffel and members of the boards of directors of France’s growing electricity corporations, between 1902 and 1914, Gaumont’s studio complex grew from only a few industrial buildings and a small, partly-enclosed studio stage to a campus consisting of more than fifty buildings and the world’s largest production studio (Figure 2). More than just a site for filmmaking, the Cité Elgé notably housed industrial manufacturing facilities as well as three power stations needed to generate electricity for studio lighting and industrial machines. Owing to its location in northeastern Paris, which would not receive municipal electricity until after World War I, Gaumont found itself forced to produce its own power. The company installed its first steam powered generator in the basement of the main studio in 1904 and added two more in 1906 and 1908 respectively. Fig. 2: “Vue de la Cité Elgé,” Gaumont Catalogue, January 1908, p. 2. Bibliothèque du Film, Service Iconographique. The three smokestacks served the Cité Elgé’s respective power stations. Fig. 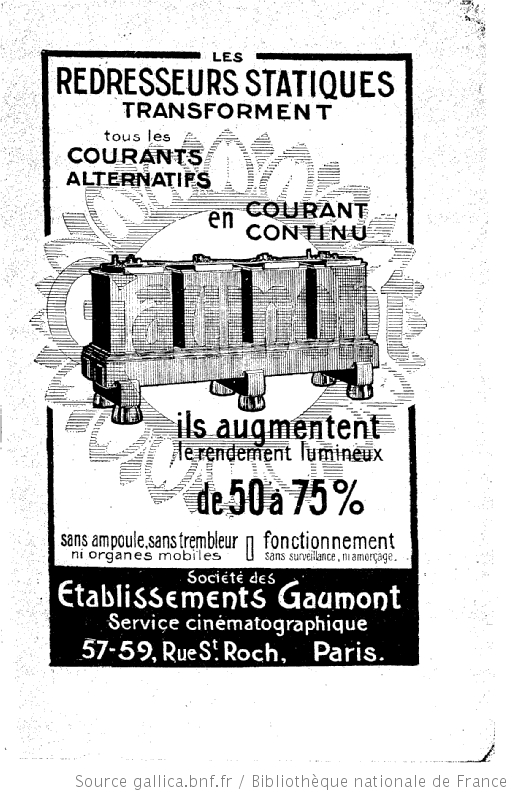 3: Gaumont Advertisement, Les Redresseurs Statiques, ca. 1911. But as Gaumont’s electrical devices suggest, innovation at the Cité Elgé would not be limited to film technologies, nor would the company’s film technologies develop in a vacuum. Rather, research and development at Gaumont created relationships between diverse technological forms, setting the stage for intermedial development. Electrical transformers would be only the beginning, and the onset of World War I would give these developments specific direction. During the war, Gaumont momentarily traded its identity as a film company for a new role in the production of what Paul Virilio has termed the “logistics of perception,” a role that would help shape its corporate logistical vision for the next decade. The onset of World War I in 1914 brought French cinema to a standstill as film companies joined their industrial compatriots in bidding adieu to workers departing for the front. For a short time the “silent” studios truly went silent. Gaumont lost more than six hundred workers18 to the mobilization effort and saw Universal City surpass it as the world’s largest film studio.19 During the war and in its immediate aftermath, Gaumont sought to refashion itself by putting its considerable infrastructure in the service of the French state and becoming what Virilio might describe as “a poor relation of military-industrial society.”20 But more than simply the straw that broke the camel’s back of an industry already in the early stages of decline – helping Hollywood emerge as the globe’s dominant film producer – World War I pushed Gaumont to capitalize on its non-film expertise in ways that would give it hope for a new place in the post-war media landscape. More generally, the expertise honed in their earlier development of film and electrical technologies allowed Gaumont’s scientists and engineers to produce what Kittler has described as “lightning war,” the implementation of transmission media (i.e. radio waves) for wartime communication. 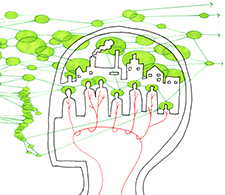 “[F]ar more important than psychology and filmic persuasion,” Kittler argues, “was to implement technical connections between storage media and transmission media.”24 The technologies and scientific knowledge needed to forge such connections had already been in formation in Gaumont’s research labs for at least half a decade. 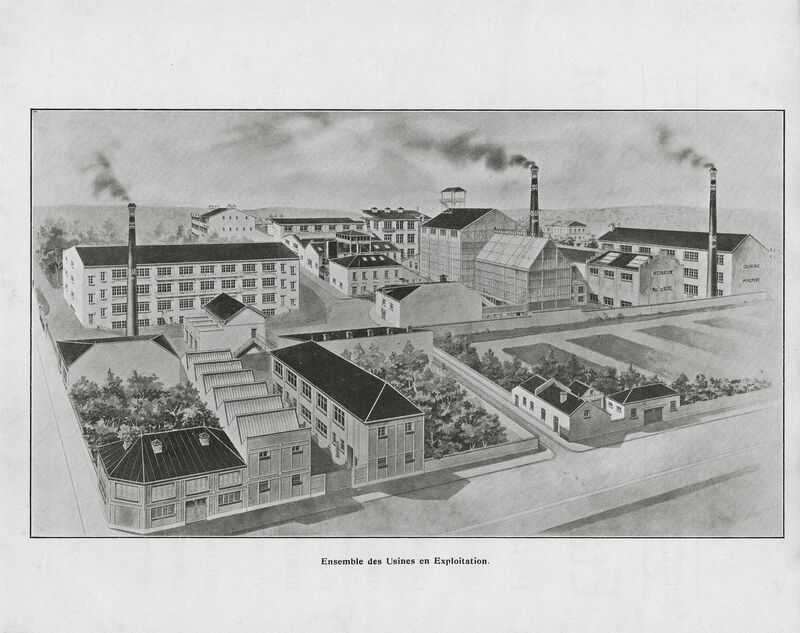 That state-sponsored military manufacturing should come so naturally to the Cité Elgé reflects the character of Gaumont’s broad-based industrial activites before the war. Cinema has always been a business founded on technologies, and these technologies have rarely been specific to cinema itself. Nor have they operated in a technological bubble. The necessity of using film in a shifting technological world meant that film companies like Gaumont could not survive without training their eyes on developments beyond cinema and creating networks of intellectual and material exchange to support ceaseless innovation. World War I further expanded those networks at Gaumont in ways that would not only help Gaumont stay afloat by supplementing its meager film profits, but also push the company to produce new products and new networks in the war’s aftermath. By the time Louis Delluc visited in 1922, Gaumont’s direct links to the French military were eroding, but the legacy of non-film technological production remained a tangible component of the company’s activities. Having stumbled out of the war with high-minded ideas of reviving the company by “making France as great in peace as it had proven itself in war,” Gaumont’s backers pinned their hopes on a broad vision of Gaumont’s role in industrial modernity.27 At the Cité Elgé – the epitome of film’s infrastructural materiality – the pursuit of a new intermedial mission would drive Gaumont into the immaterial worlds of radio and wireless communications. Such developments underscore the degree to which intermediality has long been part of film practice but not simply as a result of the similarities between cinema and moving-image media like television. Rather, the close ties between cinema, television, radio, and today’s new media have important roots in cinema’s relationships to other technologies. Such technologies became one of the focuses of Gaumont’s post-war film production as newsreel and educational film units documented France’s industrial redevelopment.28 Their films featured everything from the silk industry, metallurgy, and clock making, to mining, missile production, building construction, and Gaumont’s own new media technologies. By making media technologies part of the series, Gaumont’s educational and industrial filmmakers signaled not only the company’s own diverse interests, but also film’s important place in the new networks of media and technological production of interwar France. Fig. 4: Industrie: Haut-Parleur Lumière (Gaumont, Série Enseignement, 1920). In addition to short subjects describing Gaumont’s film machines, the series highlighted the new media products that Gaumont was now marketing alongside its film equipment. 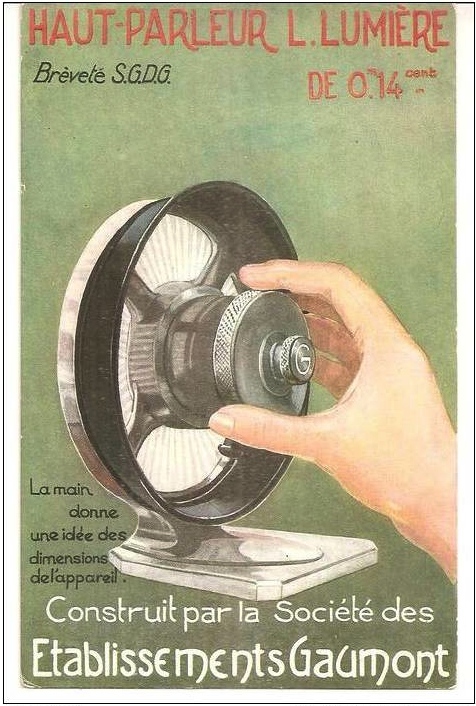 The 1920 film Industrie: Haut-Parleur, for instance, highlights the machine aesthetic of one of the company’s new loudspeakers, or haut-parleurs, by tracing the lines of its forged and polished aluminum base and folded paper diaphragm. Gaumont marketed the “L. 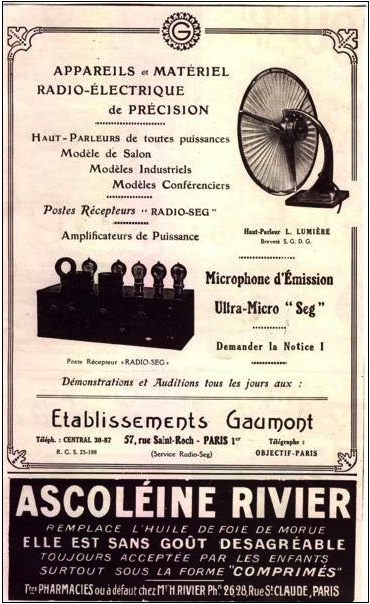 Lumière” speaker as part of the company’s growing repertoire of wired and wireless communications technologies, including radio and telephone receivers, transmitters, intercom systems, microphones, and speakers. Fig. 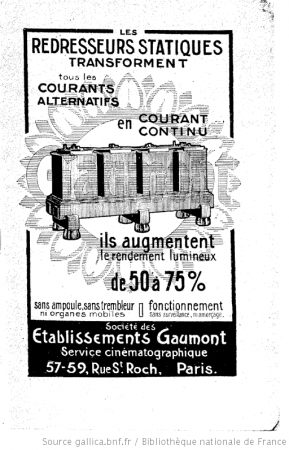 5: Gaumont Advertisement, Haut-Parleur L. Lumière, nd. Fig. 6: Gaumont Advertisement, Appareils et Matériel Radio-Électrique de Précision, ca. 1924, with Haut-Parleur L. Lumière and Poste Récepteur Radio SEG. Fig. 7: Gaumont Advertisement, Haut Parleur Lumière Type Lampe, ca. 1925. Gaumont marketed versions of its Haut-Parleur Lumière disguised as “elegant,” “pretty” lamps. Through these new devices, Gaumont’s reach spread beyond its studios and networks of film distribution and theatrical exhibition to the key nodes linking networks of modern industrialization. From rail stations and shipping yards to factories, construction sites, and mines, Gaumont’s wireless transmiters and receivers supported physical network expansion by promoting immaterial intersecting networks. These networks extended into the French home, where speakers hidden in lampshades and stylishly designed, often spectacularly colored silk coverings transformed modern technology into “elegant” interior décor. 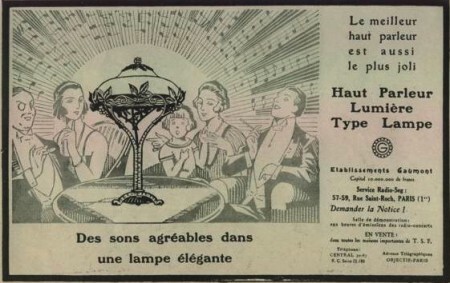 Such devices made mediated listening and viewing integrated experiences, as suggested by a 1925 advertisement for Gaumont’s Haut Parleur Lumière Type Lampe in which musical notes blend with light waves, much to the delight of two bourgeois couples and a child who gazes in wide-eyed wonder (Figure 7). In these guises, Gaumont helped set the stage for the intermedial developments that radio, television, and sync-sound film would bring in the decades to come. It did so neither through its cinema business nor its military technologies, nor even its wireless communications devices; or rather, Gaumont did so through all of these pursuits. It could scarcely have one without the others. To see Gaumont as no more than just another film company is thus to ignore the mutually-reinforcing relationships that conditioned cinema, media, and technology in cinema’s first quarter century. 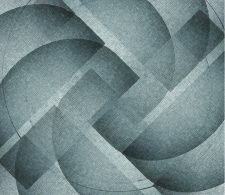 These relationships cannot be tidily untangled, nor should they be. On the contrary, companies like Gaumont must be understood in all of their facets and across the many networks they supported and that shaped the early development of techno-media practice. Given cinema’s close relationships to other communications media and electrical technologies in the 1910s, it should come as no surprise that media and technology would become important subjects of 1920s French film. From the machine-made motion that animated the avant-garde, to visions of technology run amok in such films as René Clair’s Paris qui dort (1923), to the more banal appearance of new media technologies such as Gaumont’s own “L. 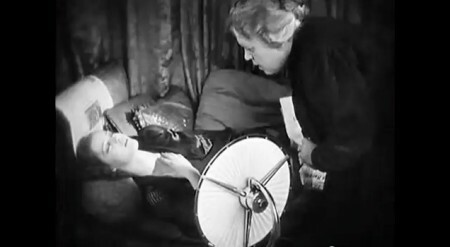 Lumière” speaker in Marcel L’Herbier’s L’Argent (1928) (Figure 8), images of technology offered opportunities for both aesthetic experimentation and reflexive commentaries on the state of cinema and media. In 1924, L’Herbier, who trained and worked at the Cité Elgé in the 1910s, made such technologies the defining elements of a quintessential modern worldview in his masterpiece, L’Inhumaine (1924). In the 1910s and 1920s, Gaumont made precisely this form of intermedial complexity its studio’s stock-in-trade. Examples such as the Cité Elgé should thus push us to reconsider our tendency to think of film studios simply as places in which to make films. Rather, studios have long played host to a variety of media and non-media practices built on tangible links between cinema, technology, and infrastructure. Seen through the lens of network archaeology, they have much to tell us not only about silent cinema, but also about the present and future of intermedial, or “convergent” media practice. Fig. 9: Studios de Paris Brochure, 2013. At the Cité du Cinéma in Saint Denis, network and media archaeologists need look no further than the studio’s light-filled nave and the antique electrical generator on display at its center to find links to the studio’s roots in factory architecture, electrical technologies, and municipal utility networks. Although the generator may be little more than studio décor today, electricity and technology remain primary selling points for modern moviemakers. Brochures designed to attract filmmakers to the studio’s nine production stages emphasize the same aspects of infrastructure that made Gaumont’s Cité Elgé a world leader in the 1910s: surface area, material structure, and electrical capacity. These advertisements’ emphasis on location – “at the doors of Paris” – signal the continuing importance of place in media culture (Figure 9).35 Much like Delluc a century ago, Besson and the Euro Media Group hope that their Cité will become a key node in global media networks and that it will help give rise to further networks of material and cultural exchange. Such hopes suggest an important opportunity for media scholars. As critical crossroads for producers, technologies, and texts, studios represent ideal sites for investigating the forms, practices, structures, and rhythms of media and media networks. Studios make visible the physical infrastructures – from studio stages and delivery docks to post-production facilities – that underpin the immaterial surfaces of network culture. They make knowable the resource requirements and protocols – from wattage, bandwidth, and throughput to editing workflows – needed to power network nodes. And they reveal the temporalities – from shooting, delivery, and release schedules to rendering times – that regulate the production and delivery of content. In short, as sites of network convergence, studios offer unusually potent sites in which to witness the interactions that animate media networks. Materialist histories of studios like the Cité Elgé will offer media and network archaeologists equally potent views of the conditions on which those networks were founded. Abel, French Cinema, 393.) Claire’s machine-made second life is only the second technological “miracle” of the film’s final act, preceded by another form of lively extension: a television-like system with which Einar transmits Claire’s voice and image around the world. More than just a representation of science fiction ideals or even a metaphor for cinema’s production of life through movement, the film’s vision of abolishing distance and traveling without moving via wireless transmission reflected the reality of what Gaumont’s engineers were attempting at the Cité Elgé. Indeed, the electrical wires, transformers, vacuum tubes, antennae, and film reels with which artist Fernand Léger created the film’s futuristic laboratory could just as easily have come from the laboratories at L’Herbier’s former employer, where scientists and engineers were making similar scenes the reality of Gaumont’s vision for an intermedial future. Image: "Chapter 1: Paragraph 13b"